TEFAF (The European Fine Art Fair) is widely regarded as the world’s most distinguished art and antiques fair. Established in 1988, it has showcased masterpieces in every category of art and design at its annual show in Maastricht, the Netherlands, which will celebrate its 30th anniversary in 2017. In a joint venture with Artvest Partners, TEFAF is expanding its horizons and coming to New York next week with their inaugural fair, TEFAF New York Fall, to be followed by TEFAF New York Spring next year. Featuring 94 of the world’s most prominent dealers, the fair will take over the entire Park Avenue Armory including the second floor where Amsterdam’s Rijksmuseum will present a special exhibit on the mysterious and visionary 17th century Dutch artist Hercules Segers, below. The first full retrospective of Segers’ work is currently on view at the Dutch museum. The thorough vetting at TEFAF is on a level that separates it from many other shows. Including over 200 experts in art history, conservation and restoration, and science, each artwork is studied in detail with the most sophisticated technical equipment and techniques that enhance the power of the human eye. The fair offers such an enormous range in fine art, design, furniture and jewelry, from antiquity through the early 20th century, that I thought I’d share a few favorites that I look forward to seeing when the show opens. 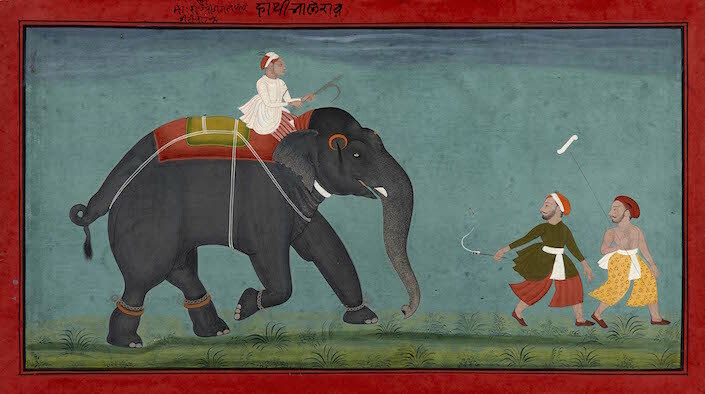 From Galerie Kevorkian in Paris, I find this work on paper, “The Royal Elephant Balerao and his Mahout,” above, enchanting. Like many Indian Miniatures, this from Rajasthan circa 1720 – 1750, includes the charm of saturated colors and expression of daily life. Cartier Mystery Clocks are objects of beauty and fascination that marry exquisite design and craftsmanship with brilliant engineering. You may remember my piece that included several I saw at the Cartier exhibit at the Grand Palais. 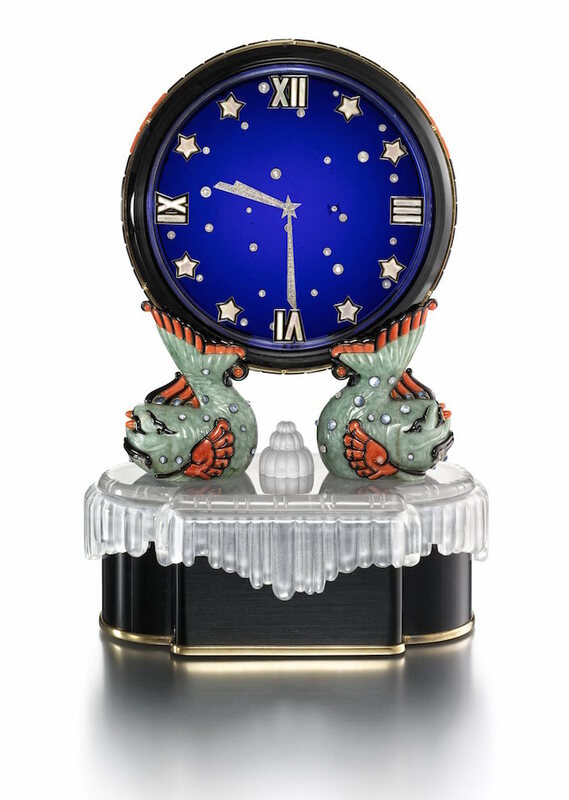 The le Ciel, above, presented by Siegelson, from 1928, is one of only thirteen models that includes antique Chinese carvings – in this case the jade carps supporting the dial. Chinoiserie is a timeless source of inspiration and japanned lacquer is a finish as elegant today as when it was created centuries ago. 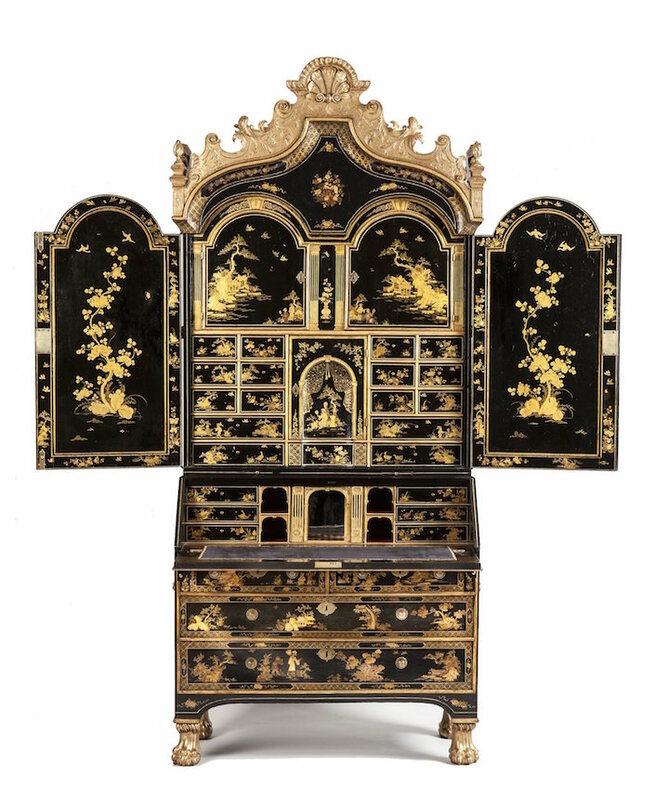 The interior of the spectacular George I cabinet above from Apter-Fredericks is amongst the best preserved examples of lacquer work from the early 18th century. 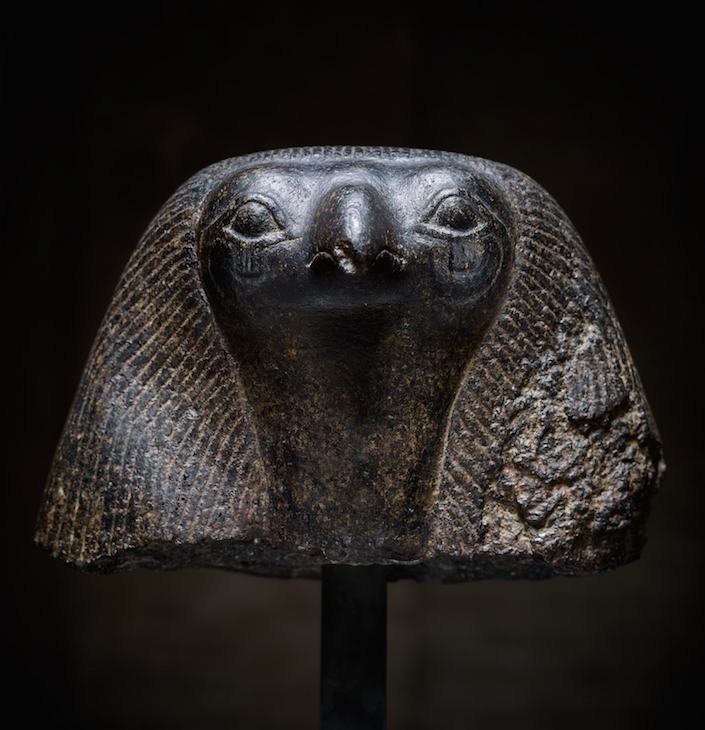 Axel Vervoordt will be showing this monolithic grandiorite (a type of igneous rock similar to granite) Head of the Egyptian god Horus, from 332-30 BC. It is always astounding to see the refined grace and understated power of such early pieces. 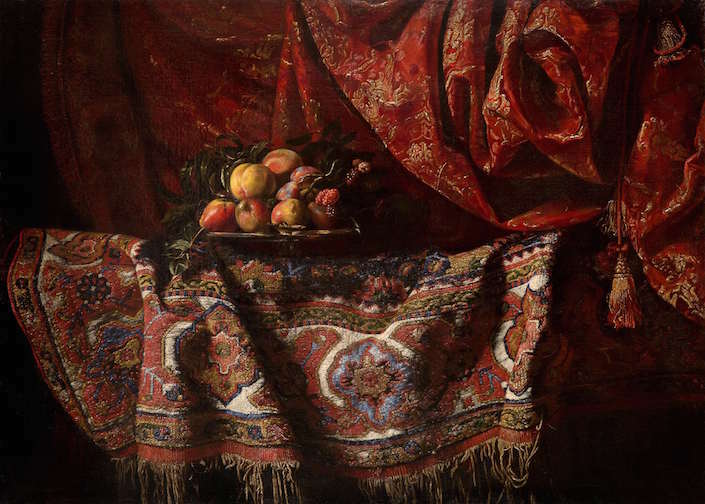 Francesco Noletti’s Still Life, circa 1650, is a rich and sultry portrait of pattern, color and exotic appeal. Presented by French & Company, the painting anticipated the popularity of Orientalist themes that would become prevalent later with such themes as Turquerie. As with the Cartier clock, master jeweler Wallace Chan has repurposed ancient Chinese jade in his modern Two Dragons Brooches for a spectacular mix of old and new. 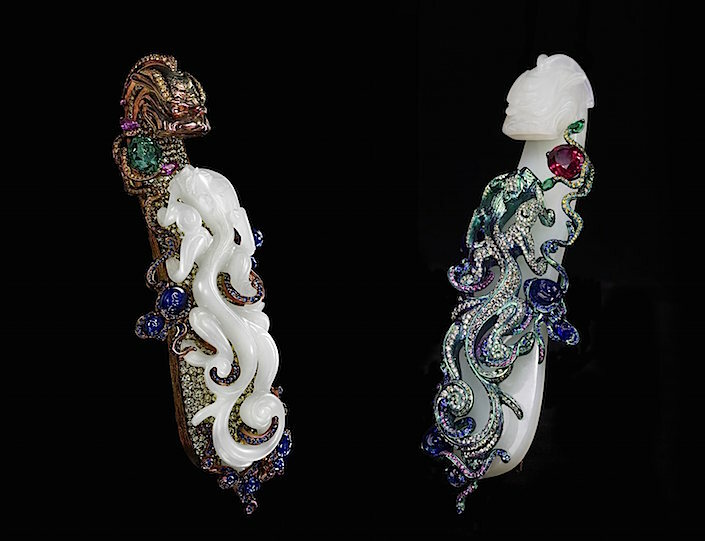 Chan sliced a Qing dynasty white jade belt hook into two, embellishing each with a “magical manipulation” of titanium and gemstones. And just as the original Qianlong period piece told the tale of a dragon father educating his son, so Chan’s pair tells the same story in a modern way. You can read more about Chan in Stellene Volandes’ new book Jeweler, which features him as one of 17 visionaries of modern jewelry design. Before Fulco di Verdura opened his eponymous New York shop in 1939, he produced pieces for Paul Flato, known as the “Jeweler to the Stars,” for his Hollywood boutique. 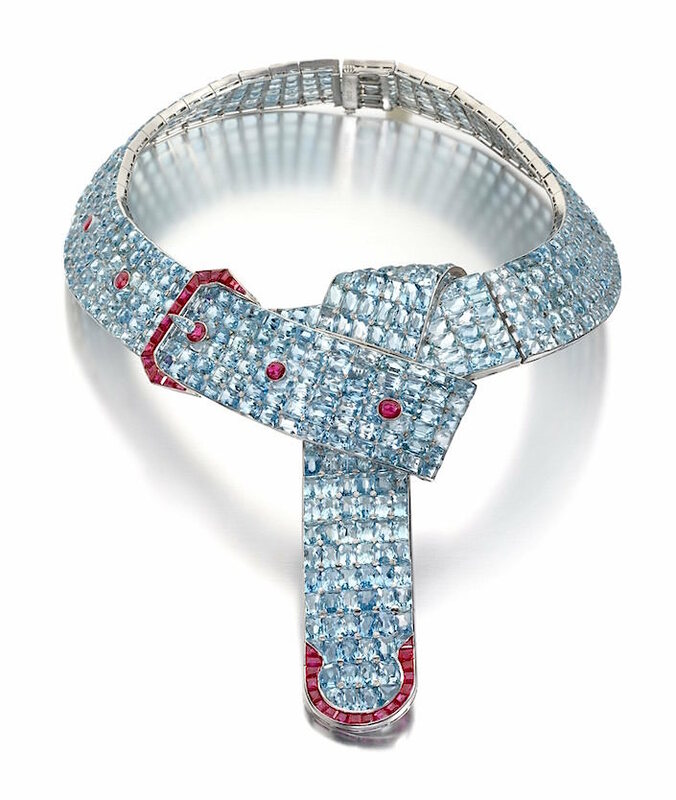 One of his most legendary designs during this “Verdura for Flato” era was this show-stopping aquamarine and ruby belt necklace, so ahead of its time in style, wit and execution. Purchased by Cole Porter for his wife Linda, both of whom were long time friends and clients of Verdura, the necklace ranks, as Siegelson, the presenting dealer, states, with no exaggeration, as “one of the greatest pieces of American jewelry design in the twentieth century.” For more about the history of Verdura, watch our video visit with owner Ward Landrigan celebrating the firm’s 75th anniversary. This unusual Meissen garniture captured my attention with its stunning purple ground and exotic shaped cartouches surrounded by charming Indian style flowering vines. 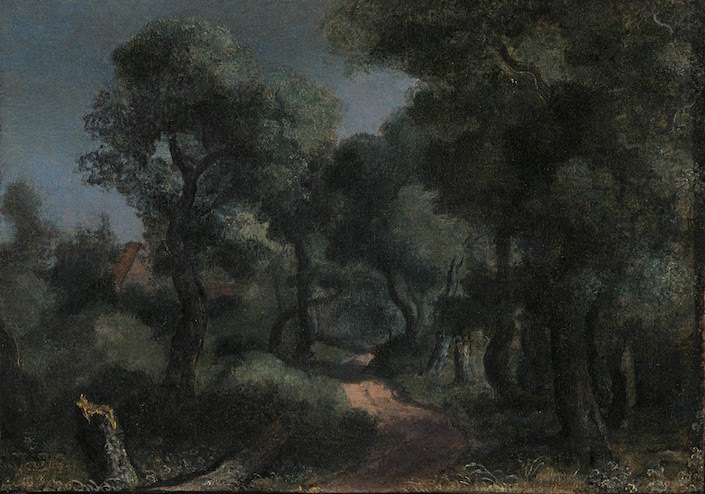 From 1735, it features scenes of both exploration and bucolic park landscapes, typical of celebrated porcelain painter Adam Friedrich von Löwenfinck. 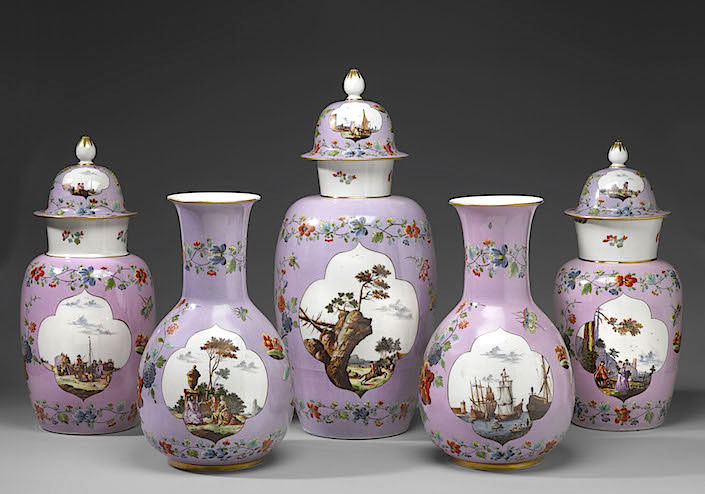 Created for the King of Poland August III, who continued his father’s obsession with porcelain, originally displayed in the Japanese Palace in Dresden and now in the Zwinger Palace, where you can visit the largest ceramic collection in the world. It is rare for such sets to have remained together all these years and so especially remarkable that these five pieces were finally reunited in 2015 and now presented by Röbbig München. 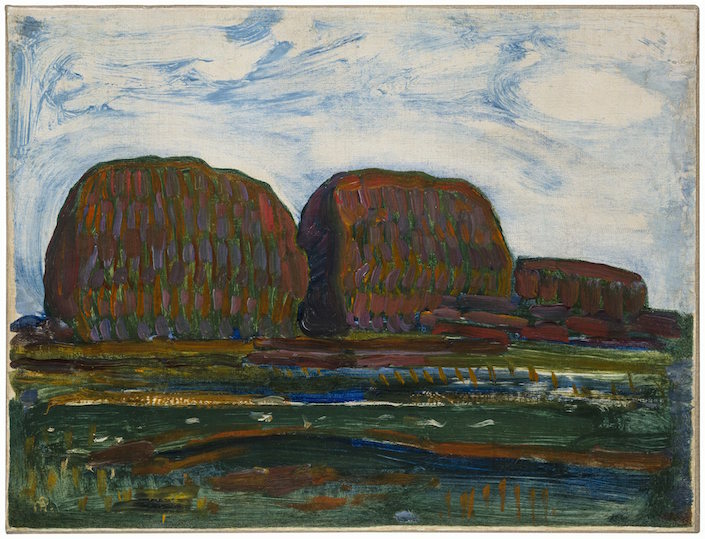 While you may associate Mondrian with his later geometric De Stijl works, his earlier traditional landscapes show the influence of his post-impressionist era, particularly Van Gogh. Yet even in this powerful emotive painting, Haystacks III, exhibited by renowned Old Master specialist Bob Haboldt of Haboldt Pictura, you can begin to see the simplification of forms. As Mondrian progressed, his desire to express the essence of nature, was distilled into a dramatically abstracted vision. This early 18th century Venetian mirror is a handsome combination of mother-of-pearl, parcel-gilt and faux tortoiseshell. 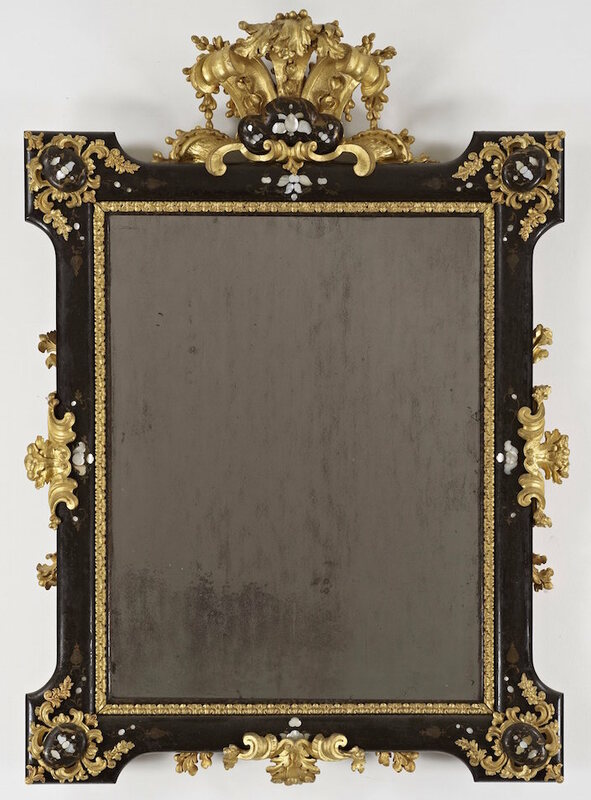 More than its ubiquitous etched mirror cousins, this example, exhibited by London dealer Burzio, shows mastery of many techniques with a desirable decorative appeal. If Claudio Bravo had not passed away in 2011, he no doubt would have been included in the T magazine portrait of talented expats in Tangier. The Chilean painter of colorful hyperrealism was an admirer of Old Masters and the Spanish greats Zurbarán and Velázquez and an aesthete who filled his home with fine art, furniture and decorative art, which often served as settings for his work. 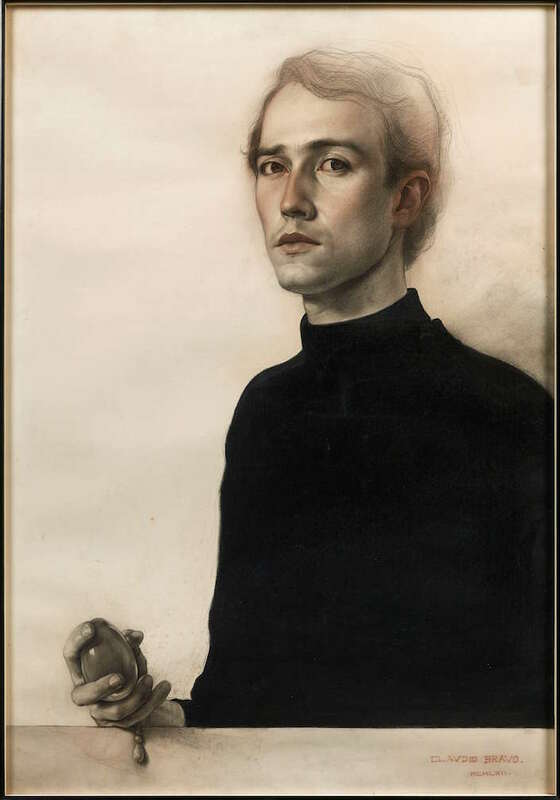 This detailed yet ethereal self portrait, completed when he was only 21, has never been on the open market and will be exhibited by Daniel Katz. Sponsored by ELLE DECOR and FENDI, the inaugural opening night of TEFAF Fall New York, on Friday October 21st, will be hosted by and benefit The Society of Memorial Sloan Kettering Cancer Center (MSK), the volunteer-led organization within MSK dedicated to promoting the well-being of patients, supporting cancer research, and providing public education on the early prevention, detection, and treatment of cancer. To purchase tickets please contact Ali Warlich in The Society office at 212-639-7972 or [email protected]. For details and ticket levels visit https://giving.mskcc.org/story/opening-night-tefaf. Hope to see you there!! This entry posted in art, design, furniture, interior design, jewelry. 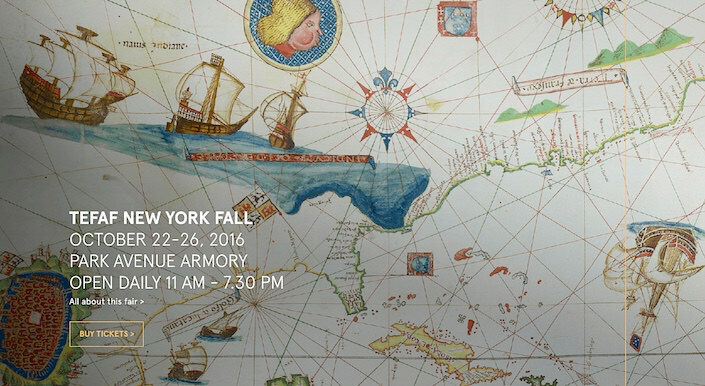 Entry Tags: antiques, art, Jewelry, TEFAF New York Bookmark the permalink. What a collection of stunning pieces, the secretary, that STILL LIFE (amazing), the aquamarine belt necklace?? Thank you for helping me with my Christmas list, now I’d better be very good for awhile! !